I have been meaning to post this for about 6 months! We are all aware of this, but I thought it would be an interesting thing to bring 'back to light' given the summer is approaching and we are all trying to get bikini body ready. It is a great thing to remain cognisant about- especially those who are struggling with those last 5 lbs. In other words, if it SEEMS TO GOOD TO BE TRUE....it probably is! I am not saying to become paranoid and obsessive- no disordered behaviour! Just to be aware! All things in moderation! Don't forget to keep portion sizes in check- and never cut out entire food groups or deprive yourself! We only live once! Remember, if the calories seem off you can always do a quick tally (Carbs=4kcal/g Fat=9kcal/g Pro=4kcal/g). I received this article from VitaCost's DAILY HEALTH REMINDER. I'll leave some really good links at the bottom! Enjoy! 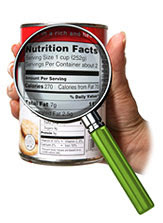 (HealthDay News) -- Many reduced-calorie restaurant and packaged foods in the United States have more calories than indicated on their nutritional labeling, a new study reports. Tufts University researchers analyzed 29 quick-serve and sit-down restaurant foods and found they contained an average of 18 percent more calories than the stated values. The team also checked 10 frozen meals bought from supermarkets and found they had an average of 8 percent more calories than what was printed on the label. Three of the supermarket-purchased meals and seven restaurant foods contained up to twice their stated amount of calories. An added complication was identified with some restaurant meals. Five restaurants provided side dishes at no extra cost, and the average amount of calories in the side dishes was greater than for the entrees they accompanied, the researchers reported. The study appears in the January issue of the Journal of the American Dietetic Association. "These findings suggest that stated energy contents of reduced energy meals obtained from restaurants and supermarkets are not consistently accurate and, in this study, average more than measured values, especially when free side dishes were taken into account, which on average contained more energy than the entrees alone," wrote the researchers, led by Susan B. Roberts, director of the Energy Metabolism Laboratory at Tufts' Jean Mayer USDA Human Nutrition Research Center on Aging. They noted that a "positive energy balance of only 5 percent per day for an individual requiring 2,000 kcal/day could lead to a 10-pound weight gain in a single year." Not only could this hamper people's attempts to control their weight, the researchers wrote, but it also could "reduce the potential benefit of recent policy initiatives to disseminate information on food energy content at the point of purchase." The American Academy of Family Physicians offers healthy eating tips. Healthy A food low in fat, saturated fat, cholesterol and sodium, and contains at least 10% of the Daily Values for vitamin A, vitamin C, iron, calcium, protein or fiber. Good stuff and all so true. I don't think it's mentioned in your list but "Calorie Free" as determined by the FDA means "less than 5 calories". Per serving, of course. This means something with 4 calories in a serving can be listed as "0 calories". A complete travesty, imo. Granted, 4 calories per serving vs. 0 isn't going to hurt, anyone...it's just the deception that's bothersome.